Branden is a Leo. I am a Pisces. 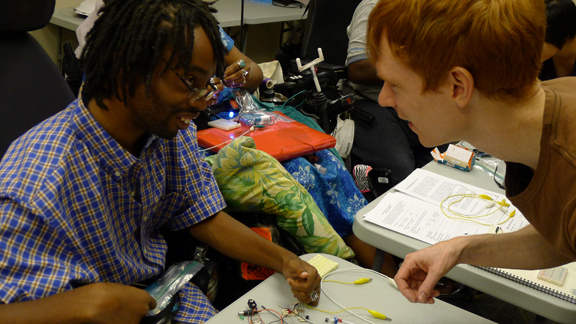 But despite our differences, we have managed to learn the basics of electronics and circuit building, familiarize ourselves with the Arduino microcontroller, grapple with the basics of computer programming, and even become friends. Working with electronics and the Arduinio has presented some challenges; finding the dexterity to build tiny circuits and conceptualizing the breadboard being the most difficult. In the end, the occasional frustrations we have experienced while using the Arduino always seem to disappear with the excitement of getting it to work. Throughout the last few weeks Branden has “seen the simple” and now “wants to go big!” He is full of ideas about how he might use the Arduino to make his life simpler, more comfortable, or just plain cooler.